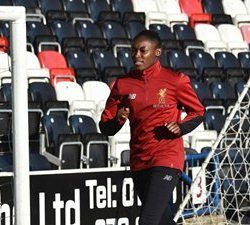 England U20 international of Nigerian descent Rinsola Babajide could make her debut for Liverpool Ladies when they tackle Watford at Walton Hall Park on Sunday afternoon. The former Watford attacker joined Liverpool on the final day of the transfer window on January 25. Ahead of the tie with the Golden Girls, Babajide has posted via Twitter a photo where she was undergoing training with other first-teamers on Friday. The 19-year-old was not in the Liverpool squad that beat Bristol City 2-0 in the Women's Super League, two days after arriving at The Reds, and it would be an emotional game for her if she's handed her debut against Watford tomorrow. The prolific striker previously played for Millwall Lionesses Ladies and Crystal Palace Ladies. Babajide will compete with Bethany England, Jess Clarke and Niamh Charles for an attacking spot at Liverpool Ladies.